We leased a Chevy Bolt EV in early November 2017. I've been driving the electric vehicle daily since then. We've also taken it on several round-trip excursions of 300 to 600 miles. I know enough about the car, its pluses as well as its minuses, to now comment knowledgeably on operating it. In short, we are pleased with the car. It works well for us and in the process has become our sole vehicle. We no longer operate a car with an internal combustion engine. In those circumstances where the Bolt won't meet our needs, we plan to rent a conventional car. Importantly, we haven't had to do so yet. First, some background. We are not new to EVs. We leased a 2015 Nissan Leaf in October 2014 and drove it for three years. In October 2016 we bought a used 2013 Chevy Volt and drove it for 18 months. Our experiences operating these two vehicles can be found on my web site under Electric Vehicles. Comments on our adventures driving the limited-range Nissan Leaf across southern California can be found under EV Trip Reports. Like most North Americans, I've been around automobiles all of my life. Unlike most Americans, I began my career by working for General Motors as a cooperative engineering student at what was then GM's Delco-Remy Division. 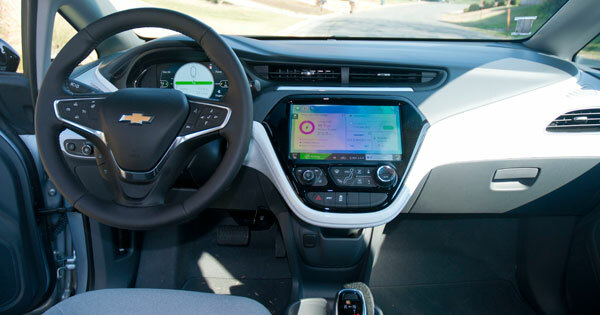 The experience wasn't a pleasant one, and I hint at how it affected my view of GM products in a test drive I did of the Chevy Volt for Automobile Magazine in 2011. I revisited that test drive once we owned a Chevy Volt ourselves, concluding that the Volt was a solid, well-built, 40-mile EV with a range-extending engine despite my negative first impression. Further, I monitor the chat on forums devoted to EVs, including those specifically on the Chevy Bolt (chevybolt.org, and mychevybolt.com). So I knew what others were saying about the Bolt before we leased our Bolt and what they have said since. Below are the topics covered. We're not paying much to drive the Bolt. That certainly affects our view of the car. We got a good deal. Others may not be so fortunate. We're paying substantially less on our lease for the Bolt than we did for the Leaf--and the Bolt is a far more capable car than the Leaf. After state and local subsidies, we're paying less than many people pay for their cell-phone plans, $84 per month. For more detail of how that's the case, see Our Lease of a Chevy Bolt and What it Cost Us. 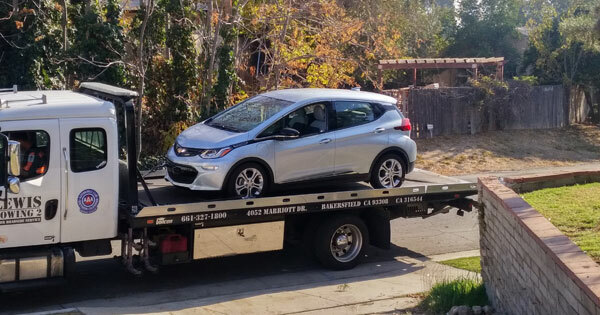 Once we got past the teething problems, (Our Bolt is Back or How a 12-Volt Battery Can Kill an Electric Car) and a flat tire, (Chevy Bolt Self-Sealing Tires Work But More Difficult to Repair) we haven't had any reason to take the car in for service. We expect to pay $500 to $600 per year for 2,500 to 3,000 kWh for electricity if we drive 10,000 miles per year. We typically drive somewhat less than that. 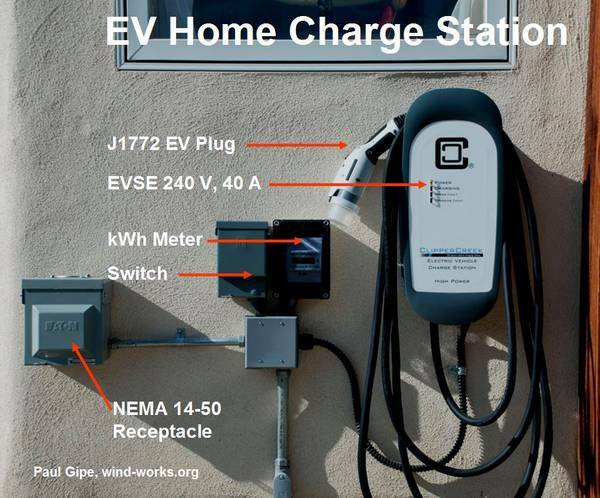 See First Year EV Electricity Consumption in an All EV Household. When we first got the Bolt we felt the ride was "choppy" or "stiff." I used to own an MGB and thought that maybe the Bolt had been tuned "sportier" than the Leaf we had leased. The Leaf had a smoother ride than the Bolt. We've grown accustomed to the Bolt's ride and no longer think about it. Michael Bornstein, PhD, MD, and an early EV pioneer here in Bakersfield (the oil capital of California) now also has a Bolt. I'll let him have the last word on the ride. His comment was that the Bolt "handles well." The Bolt has sporty, tire-chirping acceleration. Coming off the dealer's lot on my test drive I wasn't prepared for the torque-steer. I thought the car was going to jerk the steering wheel out of my hand. "Whoa," I said to the salesman. "You have to hang onto this thing." For many, including me, the car's acceleration is exciting. It's not something I use often, but on occasion I enjoy punching it. I am of the opinion that no EV should be sold that doesn't have fast-charging capability. Having the ability to charge the car quickly simply increases the vehicle's utility--if not for the original owner, then for subsequent owners. 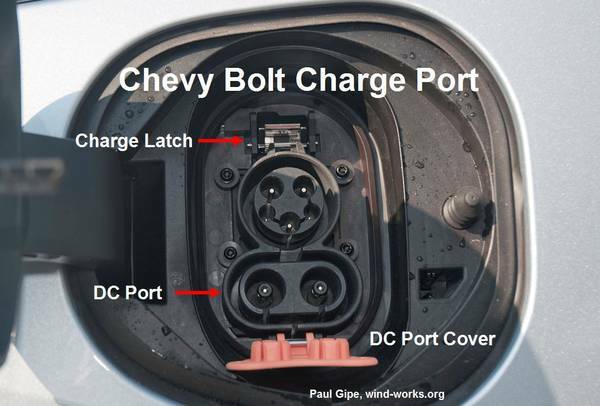 In the case of the Bolt, the fast-charging capability adds only 2% to the cost of the car. Unlike Nissan's Leaf, the Bolt uses the Combined Charging Standard (CCS) for fast-charging. The Leaf uses CHAdeMO. For many years this was "the" standard for fast charging mass-market EVs. (Tesla uses its own standard.) American and German manufacturers chose another route: CCS. And therein was the problem. At one time there were few CCS stations in California. That's now changed. Every new DCFC station being installed in North America has both CHAdeMO and CCS connections. The CCS connector, or the "Franken Plug" to critics, combines the J1772 standard Level 2 connector used for all but Tesla EVs in North America with two high-voltage DC connectors. I've now used the CCS connector several times to charge the Bolt and it's no more difficult to use than the CHAdeMO connector we had on the Leaf. Both connectors use big, heavy, and stiff cables that take some getting used to. But when you need them, they work, and that's what counts on a road trip. The Bolt works seamlessly with our ClipperCreek Level 2 EVSE that we used for the Leaf. The Bolt draws 7.4 kW from our 40-amp EVSE, slightly more than the 6.6 kW that the Leaf drew, and delivers 7 kW to the battery. We plug the car in at the end of the day, and we typically charge overnight. However, we don't charge the car as often as we did the Leaf. At the end of our lease, we were charging the Leaf every other day. With the Bolt's much bigger battery, we charge once every ten days or two weeks. One disadvantage of the Bolt is that there's such a long period between charges that you do have to force yourself to remember that it does require charging. Early in our experience with the Bolt I found myself just driving the car day-in, day-out--until I realized that I would have to charge it eventually. Once you've tried one-pedal driving, you won't go back. As others have noted, it's the way driving should be. One-pedal driving is when you use the accelerator pedal to accelerate--and decelerate. You use the brake pedal when necessary, but otherwise you drive with just the accelerator pedal--the gas pedal, in conventional cars. High-end EVs like the BMW i3 and Teslas allow the driver to tailor regenerative braking to allow one-pedal driving. The Bolt offers the option of driving in "D" and using a regenerative braking paddle on the left side of the steering wheel. Or, you can engage "L" on the Bolt, which dramatically increases regenerative braking. You can drive in "L" without ever taking your foot off the accelerator pedal, except when you come to a full stop. If you need additional regenerative braking in "L", you can also use the braking paddle on the steering wheel. This takes some getting used to but once you master it, one-pedal driving becomes your go-to driving style. When you engage aggressive regenerative braking, the brake lights are illuminated. However, the brake lights go off once the car is at rest. I put my foot on the brake pedal when stopped, to illuminate the brake lights for vehicles behind me. 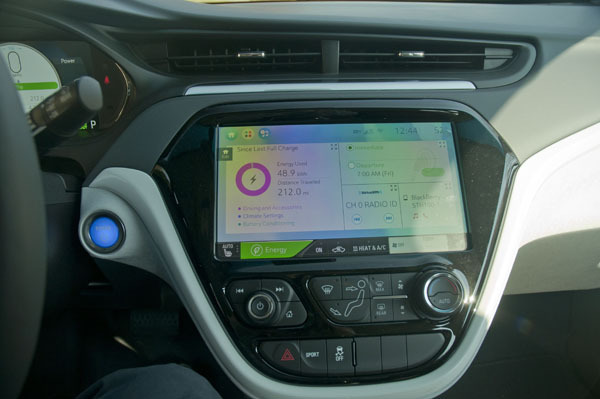 The Chevy Bolt uses the central monitor for its radio functions. You have to page through a couple of screens until you get to the radio. Then you pick your station. You can save station locations as your favorites. This supposedly replicates saving your "favorites" with the push-buttons of earlier vehicles. Ok, I get the fact that computers are integral to our lives and that we use them daily for all sorts of things. And yes they are helpful in our cars, particularly for displaying maps of where we want to go. But why in the world would you want to use a computer screen to operate a radio when you're behind the wheel of a moving car? I am a fan of tactile controls for such functions as tuning a radio. Our Nissan Leaf had tactile controls for tuning the radio. All of our cars have had tactile controls for the radio. The Bolt does not. The Bolt does use tactile controls for climate settings. They are not as intuitive as those in the low-end Leaf that we leased, but they do work. GM could have included tactile controls for the radio as well. GM does allow the driver to turn the radio on with the push of a button. And you can also "mute" the radio by pushing the same button. But you can't turn the radio off. Yes, you read that right. You can't turn the radio off. Yes, I know about all the subtleties of this function, but the fact is you can't turn the radio off--and be certain it will stay off! There are some of us who don't use background noise or white noise to mask the real world around us. When we want the radio off, we want it off. We don't want it "muted". And we don't want it coming on unexpectedly when we turn the car on after turning the car off. Fortunately, the on-line community went at this foible with a vengeance and found a work-around. Here's the script. You page through the screens to the radio, then you select Sirius XM, then you key in channel #0. Yep, type in "0" and your problems are solved. You can't do this with any other screen--only Sirius XM--but it works. It's what I use. The downside of this is that when I do want to listen to the radio I have to page through and choose another channel. This isn't something I am comfortable with while driving. Consequently, I don't listen to the radio in the car much anymore. It's just too much trouble. Since the last software update, Chevy has added the ability to turn the radio volume down to "0" and for the car to remember that state when you later turn the car back on. Previously, it wouldn't remember this state but would resume the volume at some default value. This is progress of sorts. Overall, the big monitor isn't much use to us. The ability to project my phone's GPS mapping program on a big, wide screen sounded appealing. I mistakenly thought that Android Auto would allow me to project my phone onto the screen. Silly me. I should've known that Google wouldn't want me to use any other mapping program but theirs. So, when we took delivery and our salesman effortlessly paired my phone with the car, I imagined this meshing of electronics was going to be seamless. That was when we plugged my phone into the USB port and there was no projection. Only then did I learn that it only projects Google apps. He helpfully called out for Google and said "Home." Sure enough up comes Google Maps and it directs me home. "Whoa," I said. "Google knows where my home is." I haven't used Android Auto since. All that digital real estate is wasted on us. I mount my phone on the dash as I did with our Leaf. My phone has maps already loaded on it. I don't need Google. Probably no single feature of the Bolt has engendered more complaints than the front seats. The on-line community quickly found a work around. This involved removing the seat cover, inserting high-density foam into the seat bottom and seat back, and then replacing the cover. Of course this shouldn't be necessary in a car that costs nearly $40,000. Why GM let this happen is a subject for endless speculation. The "seat is cramped, but I haven't found it uncomfortable," says Bornstein. This mirrors our reaction as well. 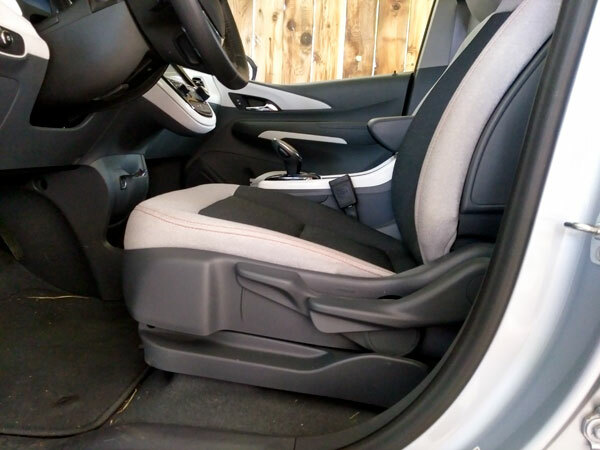 The seats are not comfortable and certainly not comparable to the seating we had in the Nissan Leaf or Chevy Volt, but we haven't found the Bolt's front seats uncomfortable. We've driven up to 600 miles in them and we didn't find them painful. Nor have the seats caused any issues with my lower back. I had surgery two years ago and I am quite conscious of how driving affects my back. I enter and exit the car using a technique common among people with back injuries. The hard plastic supporting the seat bolster makes this technique more difficult than it should be, but I can do it and I've learned how to do it with as little discomfort as possible. It may look odd, but it works. For me, entering, exiting, and driving the Bolt hasn't presented any problems. Sure, it should be better, but I tolerate this idiosyncrasy. One could argue that the Bolt is a compliance car for GM. EV advocates look askance at cars built to comply with California's clean air standards and earn compliance credits so the manufacturer can sell those big, but profitable, trucks and SUVs. GM could be selling more Bolts than they are--that's for sure. The delay getting Bolts to Canadian customers was inexcusable. Nevertheless, the Bolt is an EV that GM designed from the ground up as an EV. Most importantly, it has the biggest traction battery on the market, next to a Tesla. Specs for the Bolt were set by GM, but most of the design details were created by GM's Korean subsidiary. 60% of the car's content was added in Korea, including the LG Chem battery. However, the Bolt was assembled in Michigan by UAW labor. Disclosure: I am a member of UAW Local 1981 for freelance writers. So GM didn't build their own dedicated battery plant like Nissan and Tesla, and they haven't sold as many cars as either of their two competitors. Nevertheless, GM has made a sizeable commitment to build a brand-new car and they recently announced a modest increase, 20%, in the Bolt's production of 26,000 units per year. My take? If it's a compliance car, it's one expensive way to earn CARB credits. In the meantime the Bolt has upped the ante in the EV market, forcing Nissan to make long overdue improvements in its product and pointing the direction other manufacturers need to follow. Advantage, GM. There's a Chevy app for the Bolt EV. Critics have called the app klunky. It is slow and doesn't work reliably, but it's free for both iOS and Android. The app offers several useful features that drivers should learn how to use: Key Fob functions, Vehicle Status, and Energy Assist. As with most modern cars you can use the Key Fob functions to control the horn and lights, to precondition the car, and to lock and unlock the doors. The latter is useful if you've left the keys inside your locked car. If you have your phone handy, you can use it to unlock your car. (See Remote Unlock Using the Chevy App--Know How to Use It.) In the cold of winter or the heat of summer you can precondition the car by remotely turning the car on and heating or cooling the passenger compartment. I've pooh-poohed this convenience in the past as an unnecessary frill. However, for electric cars you can use "shore power" to precondition the car--if it's plugged in--instead of battery power, extending the car's range. This convenience feature now becomes a useful tool in getting the most out of your EV. 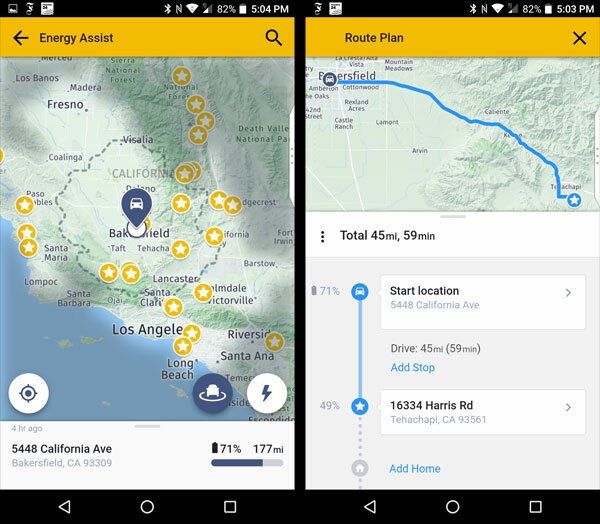 Energy Assist is a part of the app that enables you to plan your route. It is a mapping, distance, and energy consumption estimator. There are several such estimators online, and others for handhelds, but this is the only one that's integrated with the Bolt. I've spent quite a bit of time using various estimators for planning routes and charging stops. After a dozen or so trips in the Bolt, I've found Chevy's Energy Assist gives the most accurate results for the Bolt. It's not 100% accurate, but better than others. It's quirky, and there are several layers to it. I suggest Bolt drivers take the time to play with this function before they need it in a panic. It's integrated with the Bolt, showing your location, SOC, and your range. Most importantly, you can use this portion of the app to calculate the number of miles to a destination and what percentage of SOC will be necessary to reach the destination. If the destination is beyond your range, the app will recommend a charging location, length of charge, and the SOC needed to continue the trip. There was no app providing these functions for the base model Leaf we drove for three years. There may have been an app for higher-end models. I don't know. I've found the Chevy app quirky, but useful--when it works. After my mobile phone died, I reloaded the Chevy app on a new Android device. Unfortunately, the Energy Assist feature no longer worked. I uninstalled and reinstalled the app many times to no avail. Others have had a similar complaint. Some have noted that the app miraculously began to work for them after weeks of not doing so. While I was waiting for divine intervention I connected the car to the app with Key Pass to facilitate reading SOC when I am near the car. Hallelujah, that was the trick necessary to get Energy Assist to function properly. We're happy with the Bolt's interior. We leased the least expense Leaf when we began our move to electric. The interior was solid black. It was fine. We didn't care. It was just a car that happened to be all electric. When we bought the used Chevy Volt it was a much more expensive car than we were accustomed to. It had a two-tone interior. It was fine too. It was a solid, well-built car that GM employees could be proud of. The interior was pleasing, but again, it was just a car. Our "Arctic Blue" Chevy Bolt has a two-tone interior: white and dark blue. The white appointments have a textured surface. It took some getting used to, but we've grown to like it. Is this confirmation bias? Not sure. The soft blue and white tones beat the solid black of the base model Leaf we drove for three years. I don't know what the higher-end Leafs were like. Again, for us, it's just a car, so we can't understand the on-line community's debate over the two-tone interior. Some otherwise knowledgeable drivers just refuse to consider that times change and whether we like it or not we have to change too. Stylists charged with selling cars have concluded that most consumers want two-tone interiors. So there you have it. But about that radio. . . When we got the car the right rear seat belt buckle was buried under the seat bottom. I don't know if this happened on the dealer's lot or at GM's assembly plant. In either case, it wasn't easy to extract. I had to take the seat out and even then it took a few minutes to put the buckle back into its track. We also encountered some weird electronic glitches during the first two weeks. Some were so subtle that I didn't trust my own observations. The central console wouldn't turn dark at night. It was so bright I had trouble seeing through the windshield. At first I put a piece of paper over to shield my eyes from the glare. Eventually it seemed to work ok, but in the end I just opted for a dark screen all the time by paging through the extensive settings menus you reach with the central monitor. The car also died on us. And it was dead, dead, dead. See Our Bolt is Back or How a 12-Volt Battery Can Kill an Electric Car. It's been working fine since then. Nevertheless, I always carry a small Li-ion jump-start battery pack with me just in case this happens again. I also monitor charging of the 12-volt battery with Torque Pro and an OBD reader. During the winter the heated seats had me wondering about the state of my mental health. Was the electrically heated driver's seat automatically activated, I wondered. It felt that way, but the dash display said no. Hmm. After paging through the on line forums--and the owner's manual--I found that I could change a setting so the car would not turn the seat heater on automatically when I was pre-conditioning the car. If I want the seat heated, I will push a button to do so. I don't want the car to make those assumptions. The fit and finish of the Bolt seems every bit as good, if not better, than our Leaf. There's a good solid thump when you close the doors. That's always a pleasing sound in a car. The dashboard could use a state-of-charge (SOC) gauge. The "fuel" gauge on the left of the instrument cluster is Chevy's version and it suffices--as does the big center console display of the battery pack with the same information. Nevertheless, these gauges are not the same as a gauge reading SOC as a percentage of the remaining charge in the battery. For that I installed Torque Pro and an OBD reader. There's an annoying and potentially dangerous message that pops up periodically on the central monitor. It warns you not to take your eyes off the road while driving and then demands that you press a screen button that you've read the message. Of course, if the car is moving you have to take your eyes off the road to close the message. How safe is that? This is the kind of safety message that should only be displayed when the car is not moving or in Park. There's another irritating message that pops up on the driver's display. It says Park Assist Off. It happens sometimes when I've come to a stop, but haven't put the car in Park. I haven't put the car in Park because I haven't reached my destination! What's the point of this message? I don't know. It doesn't require any action by the driver and eventually goes away. The Bolt's overall visibility is as good, if not better, than the Leaf's and far exceeds that of the Volt. The interior feels spacious for such a small car. The Bolt can't carry a 4 x 8 sheet of plywood, but I don't expect it to. The trunk carries my emergency tools--like that Li-ion jump-start battery--and can carry all the groceries we need for a family of two. I've driven a half-hour with two people in the car besides myself, and there were no complaints about the seats. One advantage of the Bolt--and this is true of all EVs--is that it doesn't have a catalytic converter. Here in California wildfires are an ever-present danger and the catalytic converter on a gasoline-fueled car is a dangerous source of ignition. My wife and I participate in many outdoor activities and some of these require driving off paved roads. Typically we arrange to carpool with someone who has a big diesel truck, because diesels don't have catalytic converters. Recently it dawned on me that we could take the Bolt on a service trip. So, I loaded the Bolt with three passengers and followed a big diesel rig across range land where we were working. There was no need for four-wheel drive, and the Bolt had sufficient clearance--even with a full passenger load--to navigate the rutted ranch track. Since then taking the Bolt "in" has become a regular part of our service trips on this preserve. There's no getting around the fact that we leased the Bolt primarily because it has a big battery. Big, it is: 60 kWh. It's as big as a Tesla Model S60. 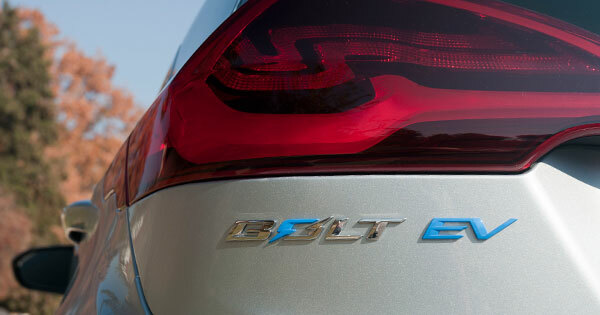 At an average efficiency of 4 miles per kWh the Bolt has a theoretical range of 240 miles. No EV other than a Tesla comes close. We can quibble over whether the traction battery is really 60 kWh, something less, or a little bit more. There's some debate about this. However, when we've run the state-of-charge down to around 10% of remaining capacity, the range indicator suggests we may have started with 60 kWh or a little bit more. We haven't driven the car down to "turtle," in Leaf lingo, and we have no plans to do so. Early in our operation of the Bolt we drove it 238 miles around town here in Bakersfield. We consumed 55.3 kWh at an efficiency of 4.3 mi/kWh and had a SOC of 10% remaining. The range indicator said we had 27 miles left. In another case we drove it 232 miles, consuming 52.6 kWh at an efficiency of 4.4 mi/kWh with 14% SOC remaining. The range indicator said we had 36 miles left. I assume we have a working range of 200 miles, about four times the working range of the Leaf's 50 miles, toward the end of its lease. Though we live in California--the best place in North America to drive electric--we live in a part of the state that until recently had been overlooked for EV infrastructure. Until the advent of the Bolt, it was very difficult to drive east or west from Bakersfield without making a real expedition of it. It was even difficult to drive southbound to the Los Angeles basin. 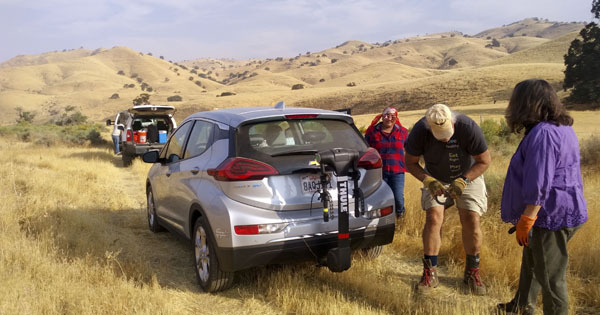 We documented the lengths we would have to go to drive almost anywhere from Bakersfield in the Leaf. See EV Trip Reports for details. For us, the big battery was necessary for the car to perform as we wanted it to. There are places we want to go that don't have charging infrastructure--unless you're driving a Tesla. That will change by the end of 2019, when two big state contracts for new DCFC stations and CalTrans' 30-30 program will be complete. (See DCFC Stations Bakersfield to the Sierra Nevada East Side Coming.) VW's Electrify America will have a slew of new DCFC stations installed by then too. By the time those stations are completed, we will have been driving the Bolt for more than two years. The Bolt's big battery allow us to drive electric to most, if not all, of our destinations today--not two years from now. For example, we've made several trips of 180 miles on one charge, including trips climbing into the nearby mountains. No EV, other than a Tesla, can do that. We've also taken a few road trips, with one over 540 miles to Santa Cruz and back. This trip required fast-charging both going and coming. To drive to Santa Cruz from Bakersfield in any EV other than a Tesla or a Bolt would have been excruciatingly difficult. You can do it, but you have to be a glutton for punishment. I say that based on our experience with the 24 kWh Leaf. We made it work because we wanted to. It was an adventure and we had fun doing it. (We saw parts of California most Californians will never see.) However, most North Americans simply wouldn't bother. We have neighbors with a Leaf. It has never left Bakersfield. It serves their needs as a commuter, but the couple's two other vehicles have gasoline engines. We only have one vehicle, it's electric, and we want to use it as much as possible. We are done with gassers, except where they are unavoidable. For the way we live, we wanted an EV with a big battery. EVs are fun to drive. We liked driving our Leaf. We like driving the Bolt. It's clean. It's fun. Its big battery gets us to the places we want to go. EVs like the Bolt are the future, and we're proud to be part of the EV revolution. Chevy's Bolt works for us.